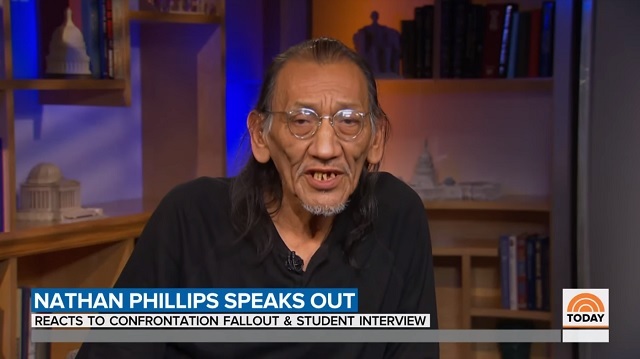 Video surfaced last night of Nathan Phillips claiming he fought in Vietnam and is a "Vietnam vet," but Phillips told NBC's "The TODAY Show" on Thursday morning he's "always said" he "never stepped foot in South Vietnam." NBC News host Savannah Guthrie effectively helped him spin the falsehood by saying, "Some have said you're a Vietnam vet -- I don't believe you have said that," before asking him about his military service. Guthrie asked Phillips: "So, to be clear, you served in the Marines at the time that Vietnam was going on but you did not serve overseas?" Phillips responded: "What I've always said is I've never stepped foot in South Vietnam. And that's -- I don't know how clear -- how much clearer can that be, you know?" As I reported at around 1:40 AM EST last night, in a video Phillips shared to his Facebook page on January 3, 2018, he stated plainly, "I'm a Vietnam Vet." "I served in Marine Corps 72 to 76," he said. "I got discharged May 5, 1976. I got honorable discharge and one of the boxes shows peacetime or, what my box says is that I was in theater. I don't talk much about my Vietnam times." The Gateway Pundit also reported the story on January 23rd at 11:02 PM EST, so NBC News either intentionally ignored it or failed to do any research on Phillips' claims. The rest of Phillips' interview was also filled with falsehoods. Phillips again claimed he tried to "walk away" from the students and go "past the crowd" but he was "blocked." He also again claimed he heard students chant "build the wall" at him and claimed he saw some videos on the "internets" where you can hear them saying "build that wall."